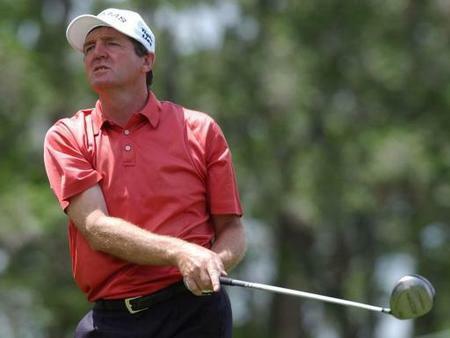 A closing 68 gave the former Ryder Cup vice-captain only his second top ten of what has been a disappointing season. And while he was happy to jump seven spots to 25th on the money list, Smyth admits that not having a coach makes it tough to know what's going wrong. After banking over $65,000 with just his second bogey free round from 21 attempts, he said: "I have been like a bogey machine all year and it is just because I haven't been confident in my swing. "I was happy that I didn't make a bogey and I birdied three of the last four holes on Sunday, which is going to be a help. "But I haven't found my game at all. I haven't been happy and I haven't had a finish until this week." Smyth is self-taught and admits that the tough times are easier when you have a coach to fall back on for advice. But he plans to get to grips with his swing flaws this week when he spends a few days in Las Vegas recharging his batteries before resuming his season in Florida next week. He said: "Basically I haven't found my game yet and my iron play has been particularly bad. "I know it is a technical problem but I just haven't been able to get on top of it yet. Unfortunately I have to work it out myself, because I have no coach. "It at times like these, when you are in a bit of a difficulty that your coach can bring you back a lot quicker than you can do yourself. "I haven't quite put my finger on it yet but I will. I'll go down to Vegas while I'm off this week, see a show or two and work on my game a little. "Vegas is a great place because there is more to do than just play golf and that's important." The situation is nothing new for Smyth, who won twice on the Champions Tour in 2005. And he is convinced that it won't take long to get back in the groove and go all out for a tournament win that would solve all his problems. He said: "I've always found that if can get comfortable with my own game, normally I can deliver results. "And I strive to find that comfort zone in my own swing where I can feel confident that I can pull off the shots I want to play." Retaining is card is the top priority for Smyth on a Champions Tour that gets more competitive every year. He explained: "I have to stay in the top 30 here and I was 32nd going into this week and now I am up to 25th. "I am still nowhere near the comfort zone and I need to play at a higher standard. "I did very well this week but I need to start doing that more often and I need to win. Once I do that, I am happy to take time out. But otherwise, I have to stay out here and grind it out." Smyth has $172,932 in the bank but will needs at least $700,000 to retain his playing rights. Jay Haas leads the money list with $654,153 from Loren Roberts, who lost to Tom Purtzer in a play-off for Sunday's AT&T title. Mark James and Des Smyth retain the Raphael Division title at the Liberty Mutual Legends of Golf. 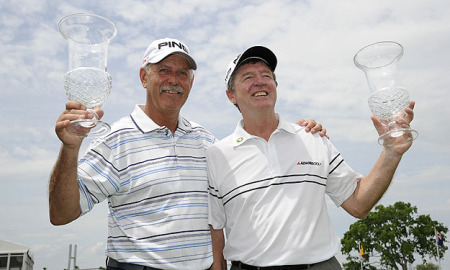 Picture courtesy of PGA Tour.Des Smyth and Mark James produced a final round birdie blitz to retain their Raphael Division title in the Liberty Mutual Insurance Legends of Golf at Savannah Harbor Golf Resort in Georgia.